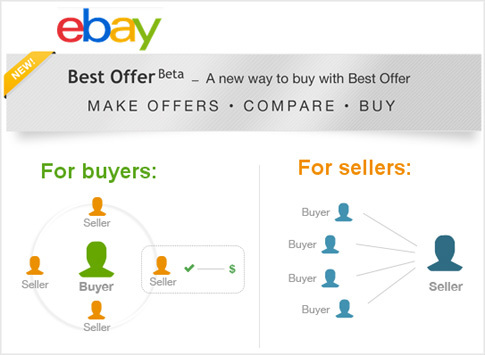 eBay has launched a new program called Best Offer Beta, available in certain categories. eBay's current Best Offer program allows shoppers to make an offer on listings where the seller offers the feature. Offers are binding, and buyers are not allowed to retract bids except under special circumstances. "Usually, when you receive an offer, the buyer is committed to buy the item as soon as you, the seller, accept the offer. This also means that you have to put items on hold while waiting for buyers to pay. Now, you can accept several offers for the same item from several buyers, with the understanding that items are not reserved for a buyer until the buyer commits to the item (and in most instances, pays for it). This change to Best Offer allows you to keep your items available to more buyers, without the need to hold items while waiting for payment. This also helps avoid unpaid item incidents." eBay also said the change to Best Offer would increase the amount of offers sellers receive and reduce incidences of unpaid item. The beta program launched last month in three categories: Computers, Tablets, and Networking; Jewelry & Watches; and Art. Sellers we spoke to said they had not been informed of the change and were surprised to see the new format. One seller said they'd encountered a bug with the program after accepting an offer from a buyer: "The system wants to charge buyer sales tax based on the listed purchase price, not on the best offer price. Long story short, there is no way for me to change the sales tax amount since the item isn't really "sold" yet! Buyer winds up overpaying the sales tax and I refund the excess thru PayPal. MAJOR waste of time for both me and the buyer." More information is available on the eBay's Best Offer Beta page on eBay.com.